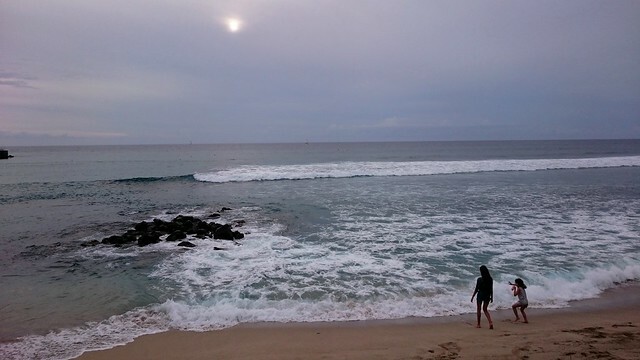 I visited Reunion Island on a 2,5 week vacation from 17 December to 3 January. A fair bit longer than holidaymakers generally spend on the island but I wanted to experience it as much as I could (weather and wallet permitting) as it had been at the top of my travel bucket list for almost 2 years. The experience has both merits and challenges. The island has amazing landscapes in the interior. I visited Cirque du Mafate, Cirque du Salazie and Cirque du Cilaos. I felt like I was in one of the Jurassic Park movies and a dinosaur would emerge at any moment when hiking in the cirques. The sights are breathtaking. If you can afford a helicopter or microlight flights then try to see the island from above. I’ve heard that it’s quite amazing (although the helicopters also present a disturbance to those seeking serenity in Mafate). You can’t mention “island” without mentioning the beaches. There’s a variety of white and volcanic black sandy beaches. Some beaches have calm waters while others have waves. 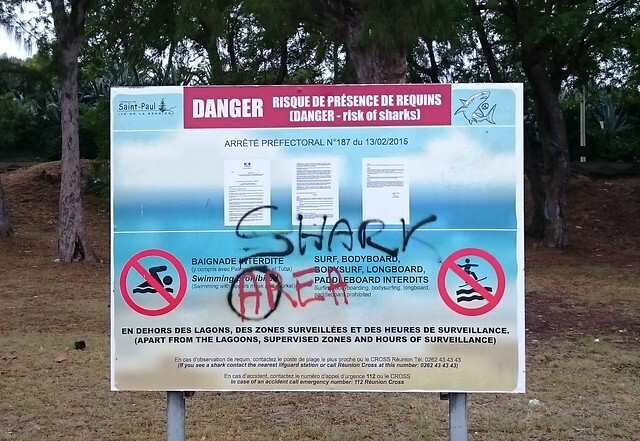 There are a number of protected areas available to swim in (lagoon shielded by rocks or shark nets with lifeguards patrolling by jet-ski and on land). The water temperature is comfortably mild. You can go in for a swim and snorkel in certain locations but surfing and other ocean sports are prohibited (shark danger). Paragliding is an option available to adventure enthusiasts almost year-round in Saint Leu. 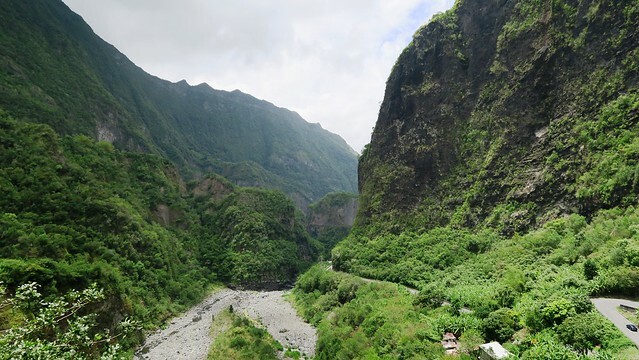 There’s plenty of rivers and I’m pretty sure over 100 waterfalls on Reunion Island. Some like the Bridal Veil in Salazie are majestic. I felt like I was in Rivendell from Lord of the Rings when driving by it the first time. 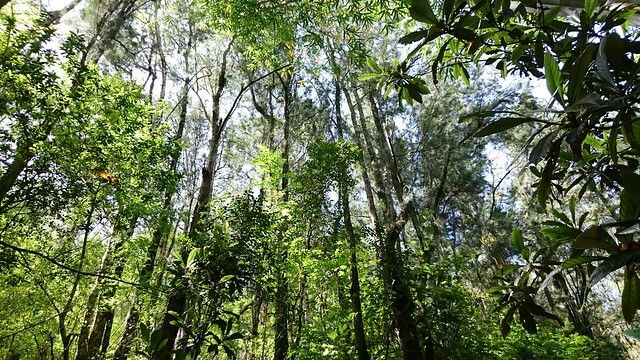 There’s beautiful forest trails throughout the island. Canyoning is quite a popular river activity that’s offered in a number of communes. I haven’t tried it out as I was on my own and I’d prefer doing it with a group of friends. Where there are rivers you’ll also find some cool bridges. My first encounter on Reunion Island did not go as well as I expected. On arrival at St Denis Airport the immigration officer asked me to step back and wait on the side while everyone from my plane and the following plane that had landed were processed. I thought that it may be a case of racial profiling which has happened to me when travelling in Europe and Australia in the past so I just kept calm, quiet and waited patiently. Apparently I look a bit older than my 8 year old passport photo (on a ten year passport). After waiting about 45 minutes the supervisor arrived, took a quick glance at my passport and my face then told the immigration officer to let me pass through. I’ve got more recent visa photos in my passport (including a Schengen visa from the French consulate in 2014) but he failed to consider this. The immigration official thanked me for waiting but I still felt that my initial reception was unwelcoming and in bad taste. To most people who pause and greet you with “Bonjour” on the trail and in the communes. I can think of many more great encounters with the people on Reunion Island. The population are of European/Caucasian, Indian, African, Creole and Chinese descent and they’re pretty proud to be a part of France. 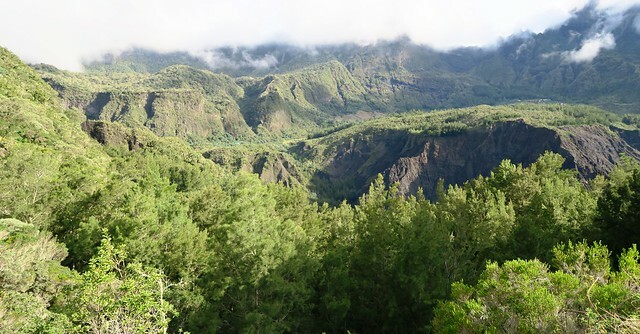 Reunion Island is classified as department 974 of France. You’ll see “I love 974 t-shirts”, #team974 hashtags being used on social media and 974 being displayed on various mediums. Read more about the history and population makeup here. What I loved was their tolerance and respect for each others culture and religion. 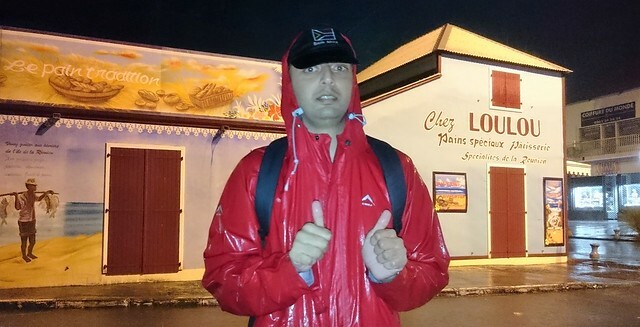 Reunion Island is very safe with pockets of minor theft being their biggest concerns. I saw single-digit numbers of beggars during my stay. These guys seemed to be abusers of liquor, weed and possibly other drugs. The youth are into rap music (blasting on their earphones or hi-fi stereos) and fashion (walking around with chains, caps facing backwards and lowered trousers). The style seemed very-80’s (in American pop culture). I was hoping to see some of the famed break-dancing that is quite popular on Reunion Island but perhaps the weather wasn’t suitable for this intense activity. 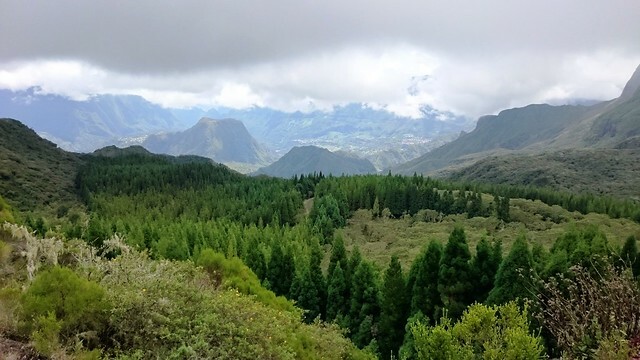 All the basics that you require for an adventure holiday are available on Reunion Island and it’s up to you to figure out how you’d like to explore this destination. However I do not believe it is a fully developed world-class tourist destination yet – not for independent non-French travelers, unlike mainland France. 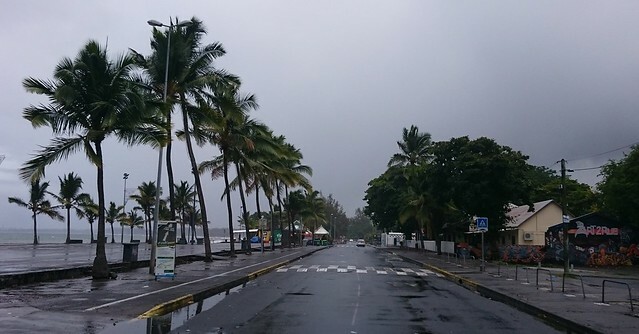 I’ve been fortunate to have traveled to many destinations but I found Reunion Island quite challenging to visit in summer when it comes to the weather, transport, food and English information. I captured some amazing pictures but there was quite a bit of discomfort behind each photo. On arrival in mid-December the weather on the coast (St Pierre) was unbearably hot. I soon traveled to the mountains in the interior where it is much cooler to do some hiking and recuperate from 19 – 26 December. It rained every afternoon and it’s generally not pleasant to hike in the rain. There’s limited opportunities to see the fascinating landscapes when it’s covered by fog or you’re in the middle of a thunderstorm (which freaked me out whenever I was near the top of a mountain). I then returned to Saint Pierre on the coast until 29 December where it was unbearably hot and then moved to Saint Gilles Les Baines and Saint Denis until my departure on 3 January. There was heavy rain from 30 December to 1 January which I believe is expected to arrive at this time of the year (before the tropical cyclones follow in January or February). I walked to L’Ermitage Les Bains from Saint Gilles Les Bains (8km return trip) on New Years Eve in the heavy rain. There were a number of private parties under the camping tents and canopies but nothing seemed to be opened to the public during the storm. I returned to my apartment and observed a few fireworks from my balcony at midnight. 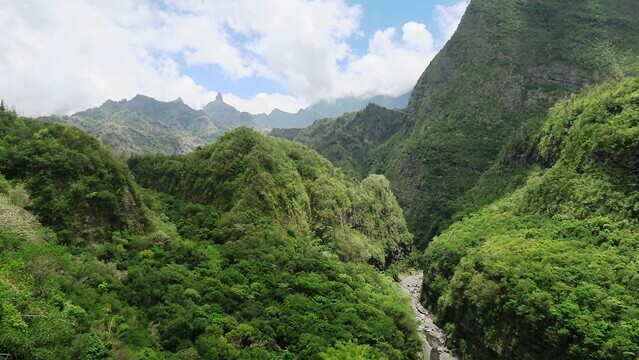 The best time to visit Reunion Island is April-May and September-November when it’s drier and cooler. Winter is also known to pleasant (similar to Winter in Durban, South Africa). More information on the weather to expect and what to pack click here. 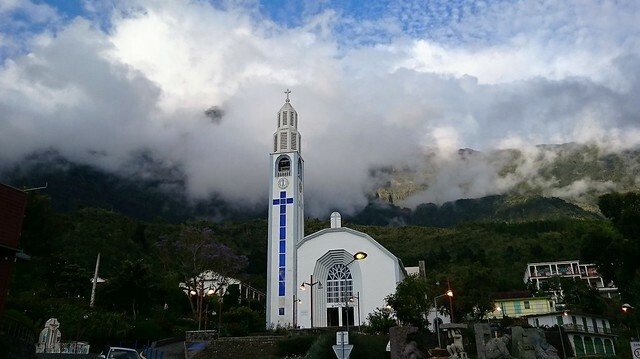 The first thing that any traveler to Reunion Island needs to do is install the Maps.me app for their smart phone and download the Reunion Island offline maps. 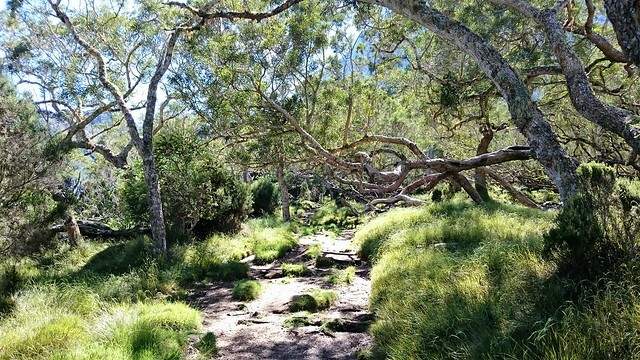 I learnt about this app from Mel’s article about hiking on the island. It’s got walking directions that includes the GR R1 and R2 hiking trails and driving directions with voice navigation. It helps you to plan in advance, show you how many kilometers are left on a trail and how close you are to your bus-drop off point. The only thing missing is altitude information so walking time estimates are wrong as they assume you’re on a level surface. Taxis are extremely costly and not visibly available in most places (except around the airport and main bus stations in some communes). I had to use a taxi on my final day to get from St Denis to the airport as the buses were not operating at the time I needed to depart. The cost was 34 euros (R600) for a ten minute, 7km ride. The bus network is pretty extensive and covers a large portion of the island. All the bus schedules and routes are available on this site. 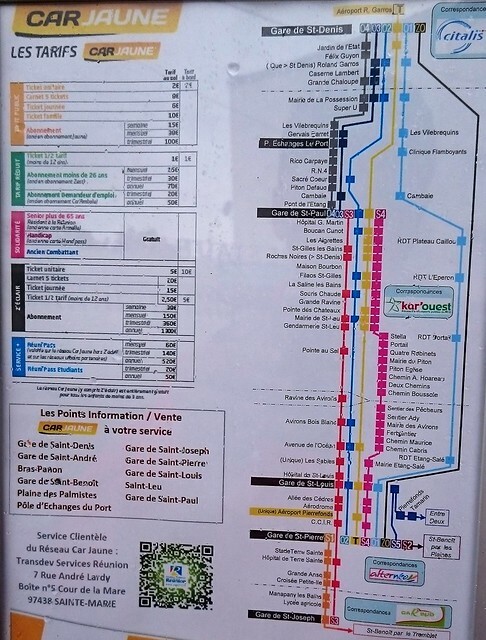 For ease-of-reference the image below shows you where the Car-jaune (yellow long distance buses) stop from the north to the south-west coast. e.g. 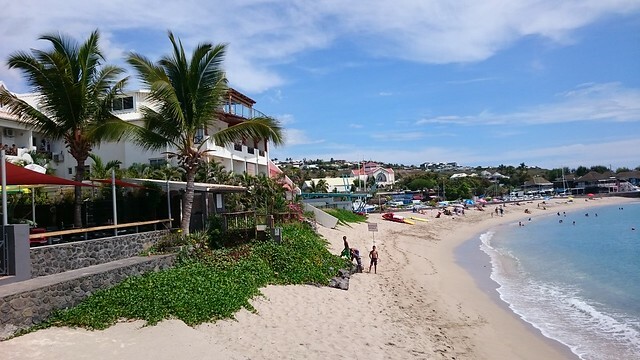 Line T picks you up at the airport and travels all the way to the south-west town of Saint Pierre. Line ZE picks you up at the airport and travels all the way to the eastern town of Saint Benoit. There’s separate bus networks that operate within each commune. The problem with the bus system is their limited availability. The main connections are only available from around 7am until 7pm, and are not really synchronised well when it comes to connections. E.g. I took the 1st bus (Littoral) of the day from Saint Pierre to Saint Louis at 0615 am. I reached Saint Louis at 0634 am, four minutes after the 1st bus of the day (line 60) departed to Cilaos. I then had to wait until 0750 am to get the next bus which reached Cilaos at 0910 am, and then wait 20 minutes to get the bus (62) to the beginning of the hiking trail into Mafate (reaching Sentier Marla at 0940am). With midday thunderstorms expected I wasn’t happy to be starting so late. 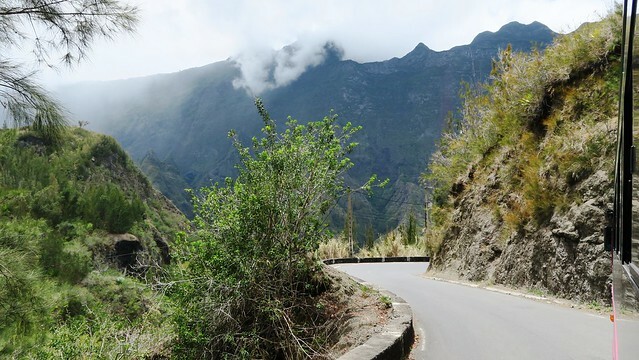 Travelers to Reunion Island are encouraged to hire a car. You’ll need to drive on the right hand side of the road and have an international driving permit. If you’re traveling into the mountains then you should be comfortable driving on some narrow bends where you need to be alert for buses driving on your lane. The roads are in excellent condition but the lighting is quite lacking for night trips. Traffic around the communes is at a stand-still in the afternoons. The authorities need to make the public transport system more accessible and discourage the need for cars. 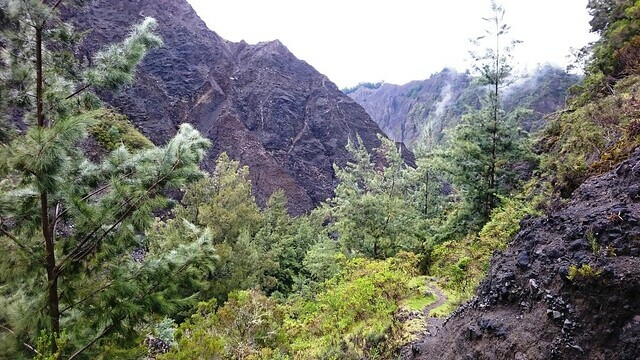 The hamlets (villages) in the Mafate hiking circuit are only accessible by foot or helicopter. My first hiking day required me to hike from Cilaos to Marla (9km from the Sentero Marla bus stop / trail starting point on the D242) and then 5km from Marla to La Nouvelle on the same day. 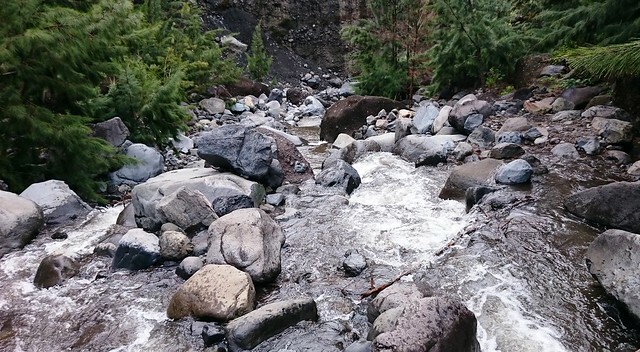 With the late starting time (to get to the trail start by bus) I tried to explore opportunities to get to Marla or La Nouvelle by helicopter but the 2 helicopter companies I contacted advised that they couldn’t help. I’d have to go on foot. I did make it to La Nouvelle on foot (9 hours later, reaching at sunset) but I’d imagine a cable car on either side of Col du Taibit or Col Des Boeufs could make the Mafate area far more accessible to more people. I know that the area is within a national park which is classified as a UNESCO World Heritage site and limited developments may be permitted but I’d argue that the constant flow of helicopters into the Mafate circuit may be equally or more disturbing. 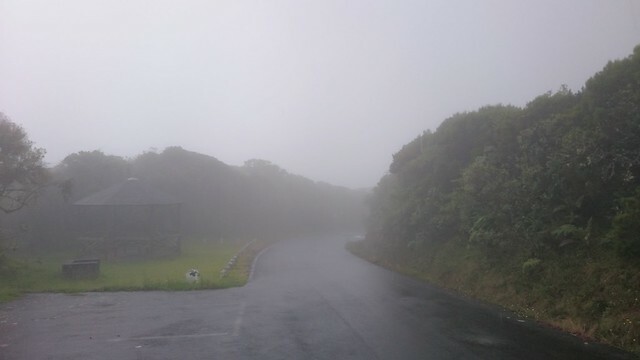 I did not feel like hiking to Caverne Dufour from Hell-Bourg when the day arrived (bad weather was expected) but I had accommodation booked in Cilaos on the following nights. To get there I had to travel by bus from Hell-Bourg to Salazie (interior) to Saint Andre (east coast) to Saint Denis (north coast) to Saint Louis (south-west coast) to Cilaos (interior). A full and exhausting day by bus (from 0935 to 1700). I wish there were an easier way for me to have traveled less than 10km between Hell-Bourg and Cilaos (e.g. cable car). 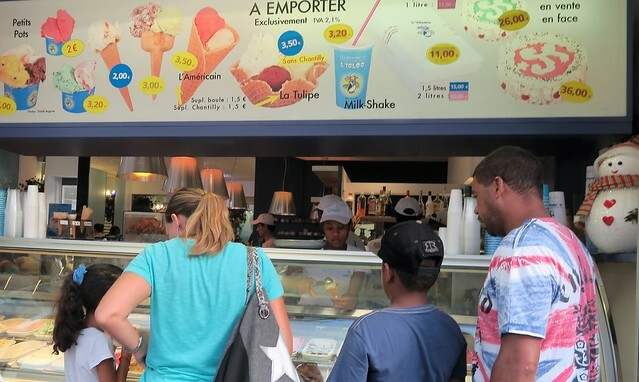 I’d previously heard of the Creole food and wonderful macaroons available on the island but I did not expect to be delighted by so many wonderful ice cream flavors. Almost every day on the coast I sampled a new ‘Glacier’ flavor. In summer you’ll see an abundance of fresh litchis, mangoes and other fruits being offered by vendors in all the coastal communes. Reunion Island is an overseas department of France and we all know that bread is a major item in the French diet. Lots of people are walking around with fresh French loaves and the bakeries are filled with pastries, breads, savories (samoosas and bouchons), cakes and desserts. If you’re on the Banting diet, looking for gluten or wheat-free options you may struggle. My difficulty centered around the times food are served in restaurants, days the restaurants operate on and the availability of supermarkets. Restaurants generally only serve food from 12-2 pm and 6 or 7 until 9 pm. If you’re in one of the cirques then you need to place your meal order before 7:30pm. I only reached my hotel in Hell-Bourg at 7pm after 2 days of intensive hiking in Mafate. I showered and walked to the only restaurant in town serving food at 0815 pm and was told that the kitchen is closed. My supper that night was dried rice crackers that I’d been carrying and water. On Sundays, the evenings of 24 and 31 December, and all of 25 December and 1 January most restaurants were closed. Only a few bakeries were available. As a person who eats halal (religious requirement) and doesn’t eat bread/gluten (food intolerance) I struggled. I lost quite a few kilograms in weight and on some days thought that I may faint from the lack of food. Yes…it was that bad for me and not what I’d envisioned for my holiday 🙁 My daily adventures became food-finding missions instead of island exploration. I had no problem finding halal food in Saint Pierre and Saint Denis. Most of the menus are written in French so I stuck to the basics – chicken (poulet) and chips (frites) from the halal vendors. Where available I ate sushi or fish (poisson) and chips/rice (riz). Most of the chocolates I brought from South Africa got spoiled in my luggage due to the extreme heat (the plastic wrapper melted into the chocolate). There is a limited variety of chocolates available on the island. Mostly Bounty, Kit-Kat, Twix, M&M’s, Snickers and a few local brands. I couldn’t find any supermarkets near my accommodation in Saint Pierre or Saint Gilles Les Bain. The one supermarket that I did see in Saint Paul was closed when I was in that commune on New Years Day. The supermarket in Cilaos (nearer to the main bus stop) does offer butane gas canisters but I only discovered this after my hike in Mafate (where I carried a stove and food that I couldn’t cook). My hotel in Cilaos on 24 December warned me that the restaurants in town would be closed that night so I purchased some chocolates, juice and an ice-cream at the local supermarket that afternoon for dinner. As of 15 January 2015 a Euro will cost more than R18 after currency conversion. 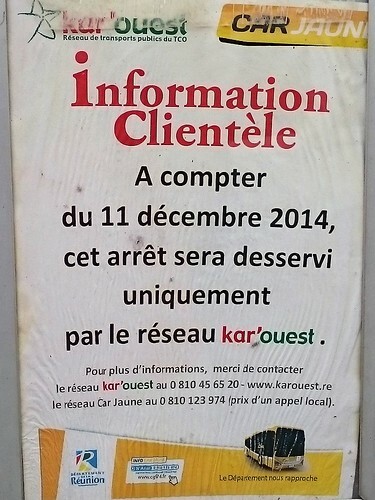 I’m not sure why there’s so limited information in English available on Reunion Island. The minimum I’d expect is bus timetables and schedule change notices to be printed in English (I wasted an hour at a bus stand that is no longer in operation because I couldn’t understand the notice). 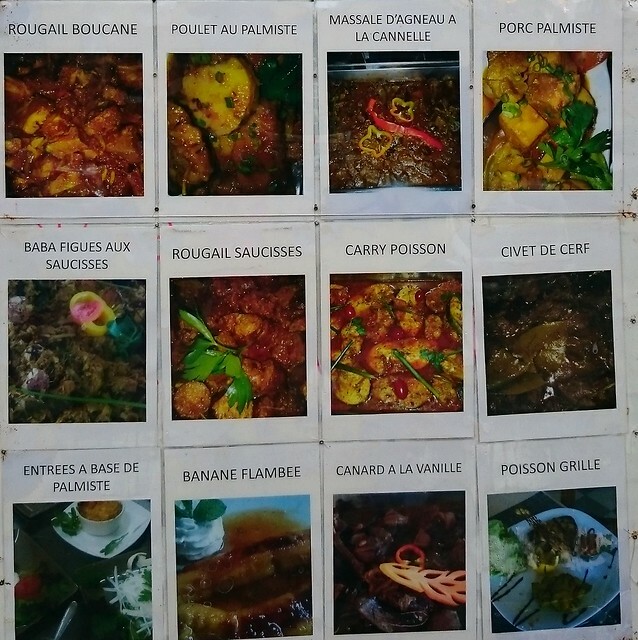 Reunion Island offers a variety of culinary delights, or so I’m told. For someone who is very careful about what they eat if I can’t understand the menu item and nobody can explain it to me then I just won’t order it. I was helped on a few occasions in restaurants where the response from the manager to “what is available” was “what do you want”? My response generally limited me to what I know and didn’t allow for me to sample anything new. All the tv-channels are in French and many of the shows seemed to focus on 18th century colonial life, Creole music videos, game shows, afternoon soapies and cartoons. 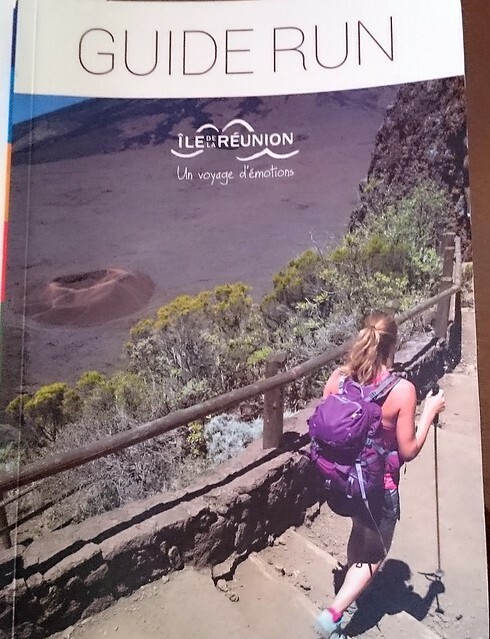 There was a Reunion Island Tourism Board guide available in my hotel room in Hell-Bourg and St Denis that offered a high level summary of tourist opportunities available. The various tourism information centers that I visited (In Saint Pierre and Hell-Bourg) were also able to offer me with some useful advice in English. I purchased a good map of the cirques from the tourism office (in French). 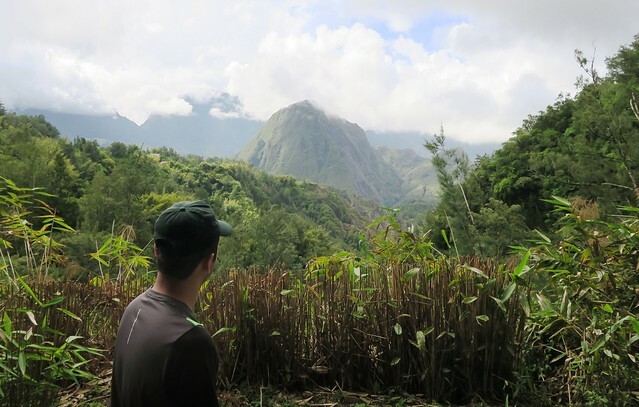 There’s very limited detailed hiking information available online for those interested in one of the islands greatest attractions -> hiking the cirques. Information on routes, distances, elevation, expected hiking times, services available en-route are extremely difficult to find. I unfortunately did not hike to the Piton de la Fournaise volcano as I couldn’t figure out how to get there using the public transport system (Cilaos to Bourg-Murat by bus and then?) and the tourism board didn’t respond to my query when I did my accommodation bookings. 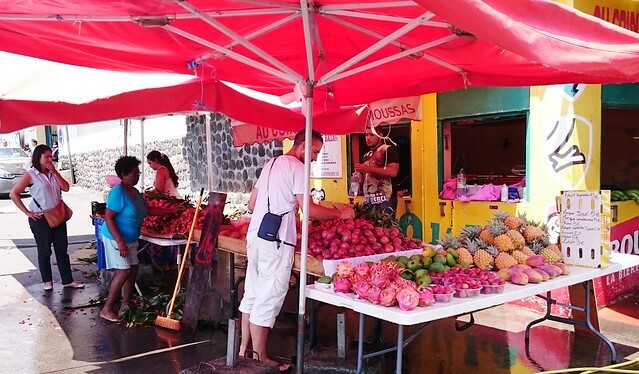 Beyond the tourism offices, if Reunion Island wants to welcome more non-French speaking tourists they’ve got to offer services in English and other languages. Mainland France and other countries have done this quite well. Still, many locals have a basic to good understanding of English (in both the cirques and coastal communes) which helped. There’s limited luxury resorts available on the island. All the hotels are pretty basic with some offering half and full-board options. In Mafate you’ll find b&b’s with dorm and double-room sleeping options. 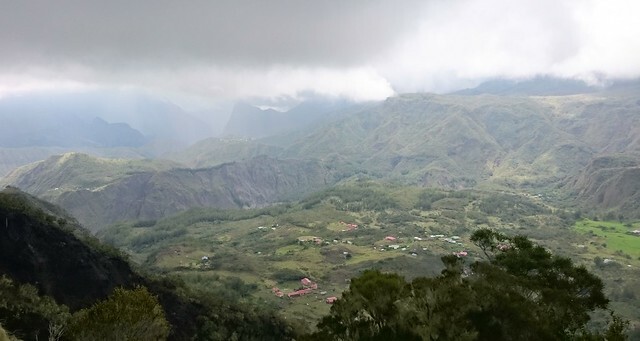 In the mountain gites (huts) in the Belouve forest, at Piton des Naiges and Piton de la Fournaise expect a basic dinner and dorm-style accommodation. There are many opportunities to improve the class of service offered by these properties and this is where the government should step in. If you’re visiting with your buddies there’s quite a few camping spots available. At L’Ermitage les Bains on New Years Eve I saw dozens of tents with campers celebrating through the night (and the rain). 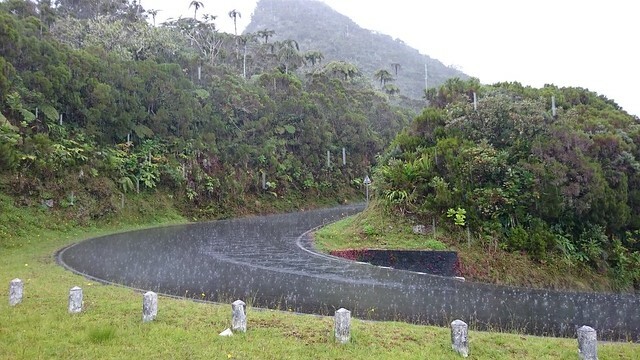 You can also camp in Mafate and at camping grounds along the route between Cilaos and Saint Louis. A popular option is to hire an apartment/studio on AirBnB. I hired an awesome studio overlooking Les Roches Noire beach on the west coast. I tried to find a suitable place to stay in Saint Andre or Saint Benoit (on the east coast) with no success. Bookings at the Mountain Gites in Belouve Forest (Gite de Belouve) and Piton des Neiges (Gite du Volcan) were cancelled as I chose to extend my stay in Cilaos and do shorter day hikes in the area. If you’re planning to spend most time in the interior then it will be okay (i.e. cooler). If you have to visit the coastal area (extremely hot with a chance of heavy rain) then visit before Christmas Eve when many stores and restaurants are still open. Christmas Eve to New Years Day is a bad option if you are relying on restaurants and shops being opened. 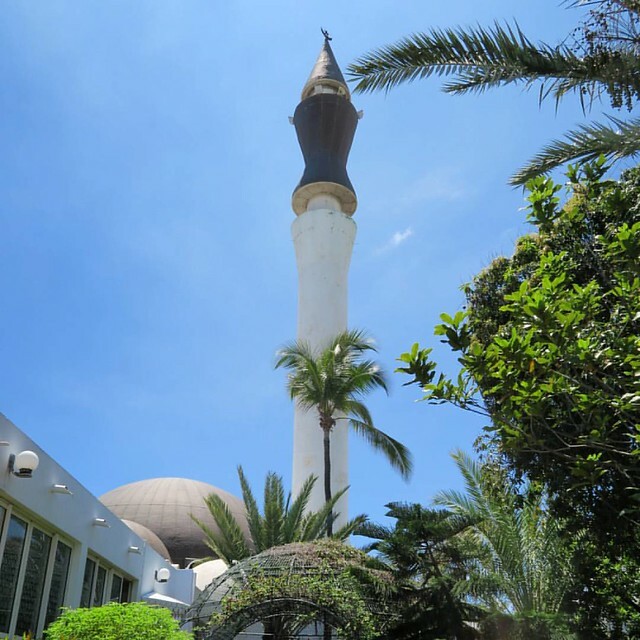 If you have no dietary restrictions then you won’t have any issues on Reunion Island, except perhaps on Sundays, public holidays and in-between the primary meal times when limited food is available. 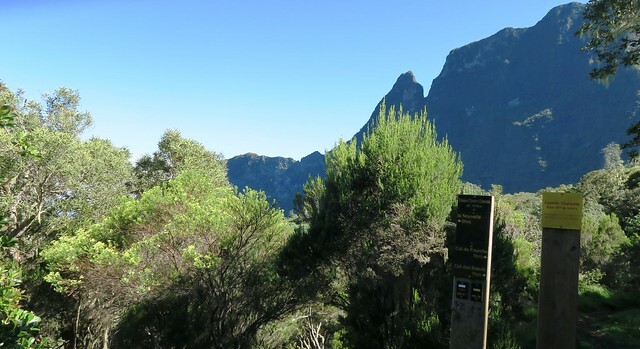 For the best climate advice check out this page by the Reunion Island tourism authority. It’s pretty accurate. 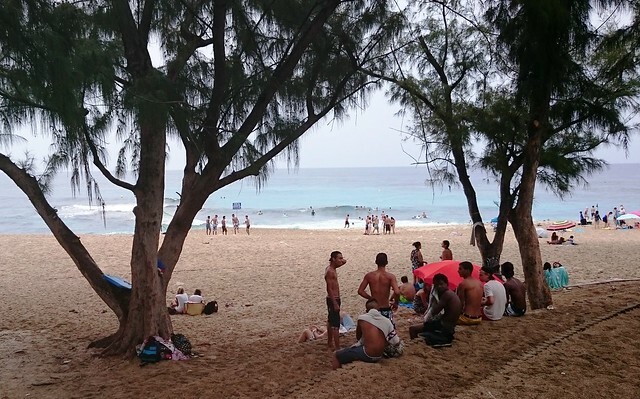 Reunion Island is not a major beach destination. If that’s what you’re looking for then combine your holiday with a visit to the beaches of Mauritius, Madagascar, Seychelles or South Africa. With the use of public transport (except for my final day to the airport) and knowing less than 10 French words, I managed to get by wherever I traveled. It was a challenge but I managed to work everything out – at the expense of time, money or sore legs. If you’re happy self-driving then transport will also not be an issue for you (except for some daytime traffic delays near the coastal communes). 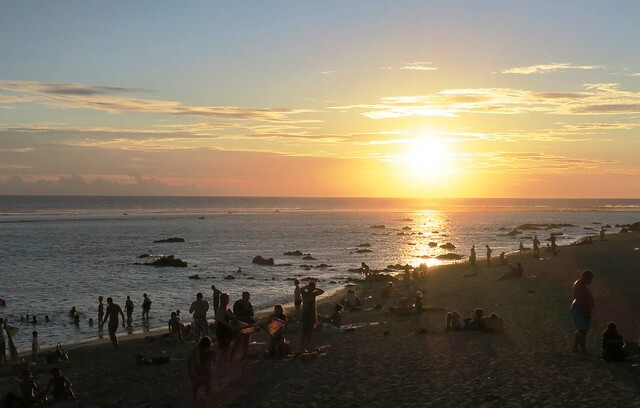 Reunion Island is slowly focusing on catering to the needs of international non-French speaking tourists and I’m sure it will be much easier to visit in the next 5 years. The landscapes are beautiful and are worth visiting to see and experience. As a South African I’m hoping that the rand will eventually recover against the Euro to make Reunion Island (and the rest of the world) more affordable to visit. Thanks Russell. I plan to share this with them. What an outstanding destination … I confess to knowing nothing about this place until recently, and this post has only cemented my desire to go there soon … thanks! 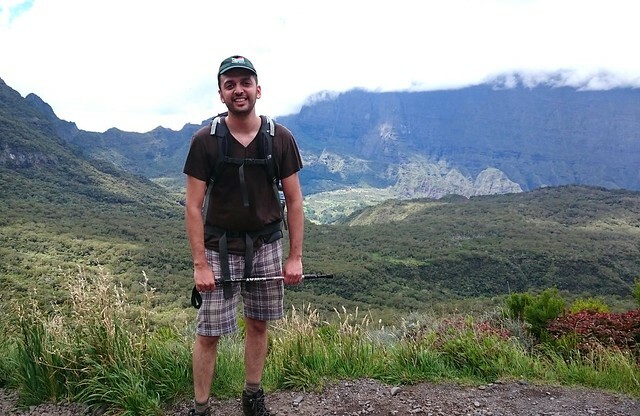 Interesting trip report, Zaid, thank you for sharing. – I would never recommend anyone who has the choice to visit Reunion in December/January/February due to the potential weather situation, which you unfortunately experienced. 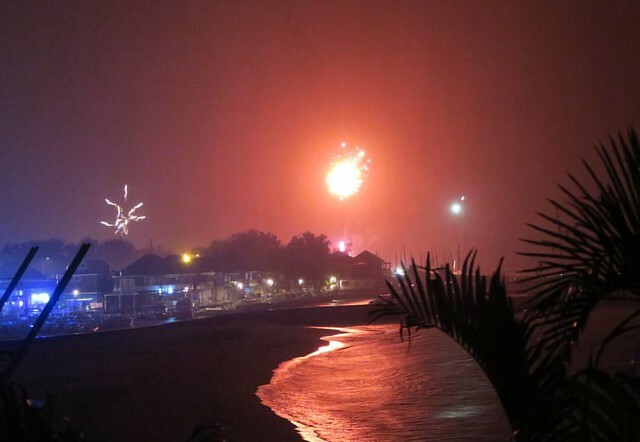 New Year’s Eve on the beach should have been heaving, but the rain put a damper to that this year. Also as some places only close three days a year (May 1st, December 25th, and January 1st) by visiting at the Christmas & New Year period you would experience two of those three days of closure. For New Year’s Eve restaurants either close or are open for expensive pre-booked meals & entertainment. 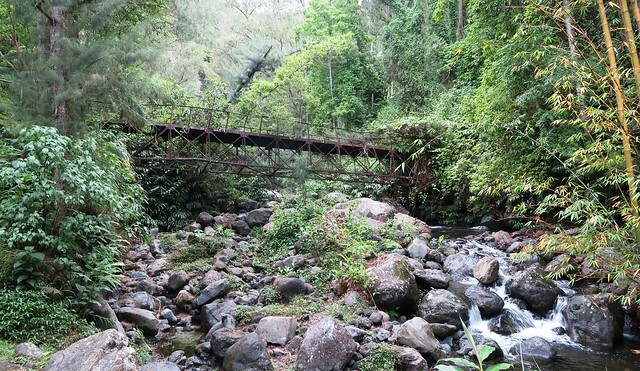 – Cable cars in Mafate: a few years ago the people of Mafate voted on whether or not they wanted to have a road enter the cirque. They voted against it, and I can’t see them accepting passenger-carrying cable cars either. 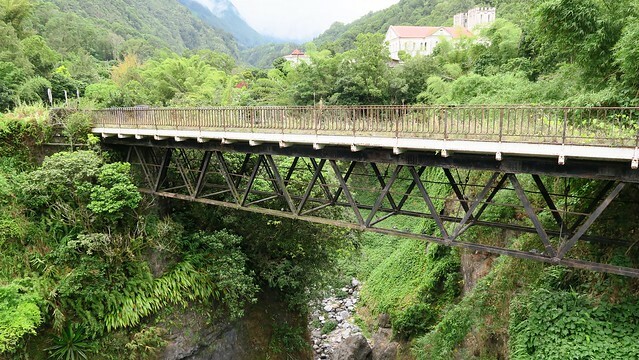 For people whose hiking skills aren’t up to scratch there are plenty of hikes to do in Cilaos and Salazie. – I’m surprised by you not finding anywhere to eat at Hellbourg at 8:15pm; I was there in the evening recently and there were about 3 different places open. Relais de Cimes is almost always open. You don’t say what day it was, but restaurants in Hellbourg do have an unfortunate tendency to not open/close early (including at lunchtime) if there aren’t many tourists/the weather’s bad, etc. etc. Not very reliable or good for the tourist industry I know. – yes, unfortunately, prices (especially taxis) are expensive! – you say “I’m not sure why there’s so limited information in English available on Reunion Island”. It’s a bit of a chicken and egg situation. Some people in the tourist industry in Reunion don’t see the point of investing in English when there are so few non-French speakers who visit the island. But without more English, non-French tourists won’t visit! To be honest I’m pessimistic about it being easer to visit in the next 5 years as the language situation hasn’t really evolved in the 25 years I’ve been on the island. Tourist translations are often of bad quality, or, in the case of Kelonia for example you have to pay more to have an audio guide in English. I arrived in Hell-Bourg on Sunday. Relais de Cimes was the only restaurant opened, but at 0815pm the kitchen was closed for new orders. I stayed for 4 nights in Hell-Bourg and managed to get food at Relais de Cimes at 7pm on the following nights. With the Tourism Authority becoming so much more active in recent years I’m hoping they will push for some changes/improvements on the island in the next 5 years (not just marketing the island externally). The fact it was a Sunday evening In Hell-bourg explains things; places tend to close (even) earlier at the end of the weekend. I also meant to say that as far as your arrival was concerned you were very unfortunate; France is currently on a high Vigipirate alert following the November 13 attacks and so even the most minor possible security breach is taken very seriously. Bravo for your pictures and observations. Thanks Zaid for an insightful write-up. We were thinking of traveling to Reunion at the end of June. Any ideas on the weather? I think it will be pleasant (like Durban weather) in June. There was no Uber, and private taxis were quite expensive. I managed to figure out the bus system which is reliable and extensive.